Nothing says “comfort and joy” during the holiday season better than a warm cup of coffee. 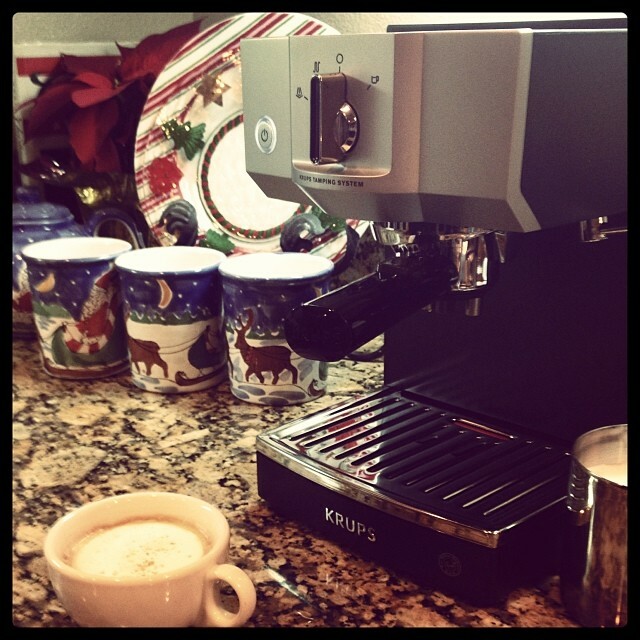 I had the chance to practice my latte skills with the Krups Pump Espresso XP5600 machine. It has been a while since I made my own latte. In fact, it has been since my college days working as a Barista. I was not sure what to expect with a home machine, but I was pleasantly surprised. It is actually very user friendly. The directions are very clear with pictures and instructions, so you don’t have to be a Barista to use it. One of the best features to this machine is the Krups Tamping System. Using the provided premeasured coffee spoon you add your coffee choice, and gently moving the handle to the right automatically tamps the coffee grounds. So simple! The Krups Pump Espresso XP5600 is also compatible with soft pod coffee. The steam function is not only easy to use; it effortlessly makes the perfect foam. The directions walk you through the process. Just make sure you do not bring the steam nozzle to the top of the milk. It will make a mess and it won’t create a creamy, frothy milk consistency. The Krups Pump Espresso XP5600 machine is truly amazing. It modernizes any kitchen with its black and stainless steel surface. The best part of this must-have appliance for any coffee lover or entertainer is that you can have a perfectly incredible cappuccino or latte in less than five minutes in the privacy and comfort of your own home. 1. You can use any coffee that you enjoy as long as it is ground very fine, almost like a powder. Krups machine makes it very quick and easy to clean. 3. Always start off with cold milk when frothing. 4. Cleaning and maintaining your machine will keep it working to top performance. we bought a KRUPS XP5600 in the Philippines where we live. The machine looked very good, easy to handle, no electronics (as we live near the sea. But the waterflow is too low, the coffee is too hot and at the end the chromated coffee holder was looking like scrab and the plastic on it cracked. I would never buy a KRUPS XP5600 again,.